People dress like mountain men at the 1838 Rendezvous, which takes place July 2 - 5 in Riverton. 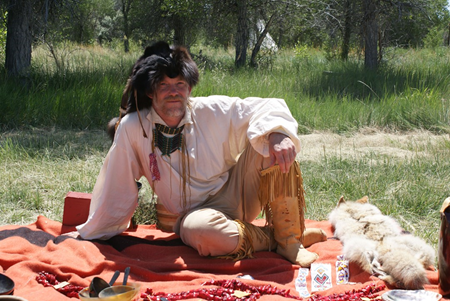 The Green River Rendezvous takes place July 6-9 in Pinedale. Visitors to South Pass City pan for gold. The town, which is located 35 miles south of Lander, has been restored to what it may have looked like during its last gold rush in the late 1880s. Fancy Shawl Dancer Carol Melting Tallow competes in fancy shawl dancing at the Plains Indian Museum Powwow last year. This year's event takes place June 21 - 22 at Buffalo Bill Center of the West in Cody. The Woodchoppers Jamboree takes place June 14 to 15 in Encampment. Fancy-shawl dancer Carol Melting Tallow competes in fancy-shawl dancing at the Plains Indian Museum Powwow in 2013. A wide variety of people, from American Indians to Chinese miners, have called Wyoming home. Many communities throughout the state host festivals to share the history of those who settled there and how they lived. Check out these cultural events for a fun and educational family outing. What: Woodchoppers compete for the title of Rocky Mountain Lumberjack in events such as ax throwing, pole throwing, ax chopping, chainsaw events and one- or two-man handsawing, among others. Watch cowboys and cowgirls test their skills in the WRA sanctioned rodeo. Both events have children’s contests, such as a greased pole climb and boot race. You can also see a parade, enjoy a daily barbecue lunch (for a fee) and catch a melodrama at the Grand Encampment Opera House. Where: The rodeos and woodchopping events are at the Encampment-Riverside Lions Club Arena, 17 McCaffrey Ave. in Encampment. The Grand Encampment Opera Company performs at the Opera House, 622 Rankin St. in Encampment, which is about 63 miles southeast of Rawlins. What: Enjoy shopping for crafts and fine art, eating good food and listening to live music. There are also children’s activities, American Indian dancers, a chili cook-off, a triathlon, a horseshoe tournament and more. Don’t forget to take a stroll through the Pioneer Village, where craftsmen in period clothing demonstrate 1800s skills. Where: Marge Grover Memorial Park/Donn Wooden Civic Center 111 U.S. Highway 29 in Alpine, 36 miles southwest of Jackson. What: Dancers, drum groups and artists from Northern Plains tribes gather to celebrate their vibrant cultural traditions and compete in dance. Dance categories include traditional, jingle dress, fancy, grass, team dancing, tiny tots and chicken dance. Visitors can learn about powwow, shop for authentic American Indian jewelry, clothing, art and more and taste fry bread and Indian tacos. Bring chairs or a blanket to sit on. What: Relive the early 1800s, when mountain men, explorers and American Indians met to barter, sell or swipe skins, pelts, guns, trinkets and provisions for the coming winter. See demonstrations on the tools and trades of the day and learn the history of the fur trade. There are also kids' activities, rodeos, a kids' fishing derby, Native American dancing, fireworks, a parade and live music. When: July 10-13. The pageant is at 1 p.m. July 13. Where: In downtown Pinedale, about 77 miles southwest of Jackson. The rodeos and pageant are at the Pinedale Rodeo Grounds, which are south of town off U.S. Highway 191. Additional activities are at the Museum of the Mountain Man, which is located at 700 E. Hennick St.
Tickets: FREE. Fees may apply for certain activities, such as the rodeo and museum admission. What: Enjoy a taste of life at the turn of the century at South Pass City State Historic Site. Gold Rush Days features a vintage baseball tournament, music in the historic saloons, kids’ games and one-of-a-kind events such as anvil blasting, mining demonstrations and, of course, gold panning. What: Enjoy an authentic Western weekend complete with museum tours, cowboy poetry and live music. There is also a stick horse rodeo, campfire jam session, chuck wagon breakfast and more. Don't miss the All-Star Cowboy Poetry and Music show at 7 p.m. July 19. Where: Throughout Encampment: Grandview Park and the adjacent Grand Encampment Museum, at Barnett and Eighth streets. The All-Star Cowboy Poetry and Music show takes place at the Grand Encampment Opera House, 622 Rankin St.
Tickets: The All-Star Cowboy Poetry and Music show costs $15 for adults and is FREE for ages 12 and under. Other activities are FREE, but you’ll need a chair or blanket to sit on in the park. What: With model train layouts, train vendors, rail art, quilt show, turntable rides and food vendors, this festival is fun for the whole family. If that's not enough, the Uinta County Fair, a car show and downtown sidewalk sale also take place in Evanston that weekend. Info: Contact Roundhouse Restoration at 307-783-6320 or 801-779-2763. What: Japanese-Americans were incarcerated at Heart Mountain in northwest Wyoming during WWII. This annual event features guest speakers, a film viewing and meals. The theme is “Honoring Selfless Service” with a focus on honoring soldiers who were held there. Where: Heart Mountain WWII Interpretive Center, in Powell. 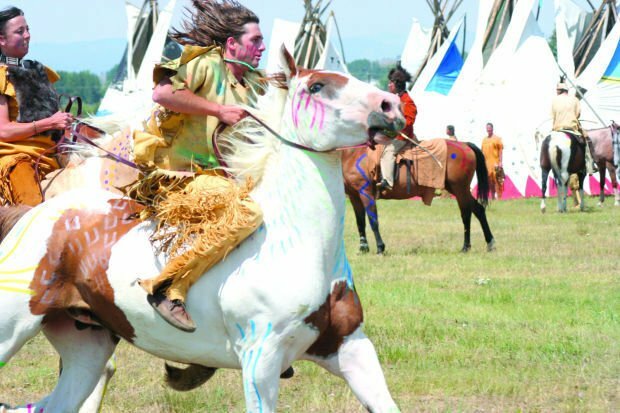 What: Watch people compete in the Native American dance and drum contests. The dance competition includes traditional, jingle dress, fancy, grass, prairie chicken and kids' categories. Don't miss the grand entry at 1 p.m. No drugs, alcohol or pets are allowed at this event, but there will be food vendors. When: 10 a.m. to 10 p.m. Aug. 30. Where: Carbon County Fairgrounds, 523 Rodeo St. in Rawlins. Carol Seavey is the features reporter at the Casper Star-Tribune. Contact her at 307-266-0544 or carol.seavey@trib.com. Follow her on twitter @Carol_Seavey. Read her blog on trib.com. Small towns with top-notch museums are sprinkled among the state's most popular tourist attractions. Some of the communities may be trying to get a piece of the tourism pie, with the hope of diverting travelers on their way to Yellowstone National Park, while others simply aim to preserve the past. Either way, small-town museums can offer more personalized interactions with museum staff and volunteers, easier access to exhibits and one-of-a-kind artifacts. This summer, take a detour to experience one of the following museums. It will be well-worth the stop.